The USD 410 Chess Guild is the Class 1A-2A state champions for 2018. They played in Lawrence against the best of Kansas March 10. Pictured are (from left) Jason Latham, Trace Jost, Abigail Fryhover and Kayla Gunn. 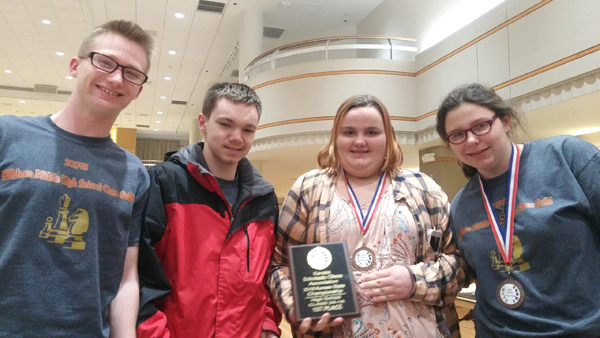 A week earlier, the USD 410 Chess Guild placed first as a team in the K-12 division of its home tournament. Competing on that day were Jason Latham, Kayla Gunn, Trace Jost, Abigail Fryhover and Jacob Den­holm.